Sure, it’s fun to go to your favorite donut shop and select your preferred donut to eat with your morning coffee. However, as good as it may be, it doesn’t quite compare to a homemade donut. Here’s a recipe for classic glazed donuts that will leave you wondering why you didn’t start making your own donuts a lot sooner. Warm the milk to 112 degrees Fahrenheit in a small saucepan or in the microwave. Transfer it to a medium-sized mixing bowl. Whisk in the granulated sugar until the sugar dissolves. Whisk in the yeast and let stand for about 10 minutes, or until the yeast causes the mixture to bubble. This is a sign that the yeast has been activated. Melt the butter in a small saucepan or in the microwave and transfer to a medium-sized mixing bowl. Beat the eggs with a fork in a small dish and whisk into the bowl with the butter. Whisk constantly until the butter and eggs are well mixed. Transfer the butter and egg mixture to the bowl with the yeast and beat on low speed for a few minutes until the two mixtures are incorporated. Add the flour and salt to another bowl and whisk together with a fork. Mix ½ cup of the flour mixture at a time into the bowl with the liquid ingredients with the electric mixer set on low speed. Keep adding the flour until it’s all gone. Mix for an additional 5 minutes after all the flour is added. Be sure to scrape the bowl before the 5 minutes are up so that all the dough is mixed. Using a pastry brush, brush oil on the inside of a medium bowl. Add the dough and cover with plastic wrap. Set in the refrigerator for around 8 hours, or overnight. Remove the dough from the refrigerator and let it reach room temperature. This will take up to two hours. Place the dough on a lightly floured surface. Using a rolling pin, roll the dough out until it is about ¼ inch thick. 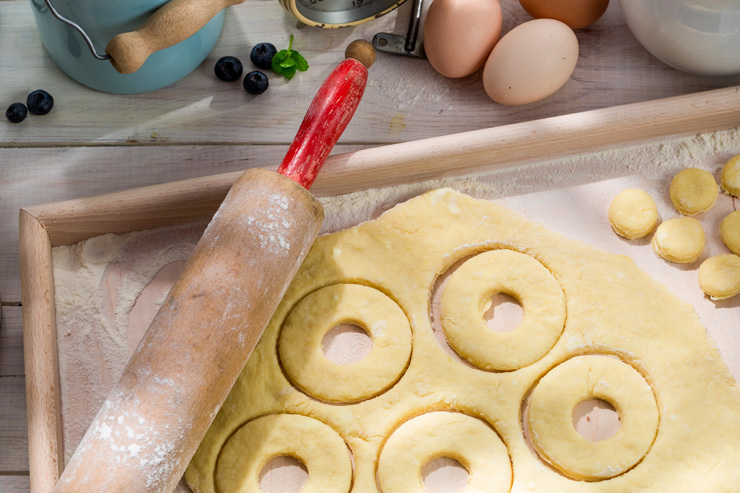 Cut donut shapes using a donut cutter. Remove the holes and place both the holes (you can fry the holes, too) and the donuts on lightly floured baking dishes. Cover with towels and place in an area where they won’t be disturbed. Let sit for about 2 hours, or until the donuts and holes have doubled in size. Place oil into a deep frying pan and heat them until the oil reaches 350 degrees Fahrenheit (use a candy thermometer to measure it). Place the donuts one at a time in the frying pan, making sure they’re spaced out enough so they don’t stick. Donuts will sizzle and puff up immediately. Flip after about a minute and cook them on the other side. Remove the donuts when they’re fried to a golden brown color. Place them on paper towels to drain. Let them cool slightly before enjoying them. Eat the donuts as is, or let them cool completely before dusting them with confectioners’ sugar.